Along with flowers, stationary wasn’t something high on our budget priority list. We just wanted simple invitations, A5 flat white paper stock, no embellishments, bells or whistles. The Groom designed them (and a friend printed them) – too easy! 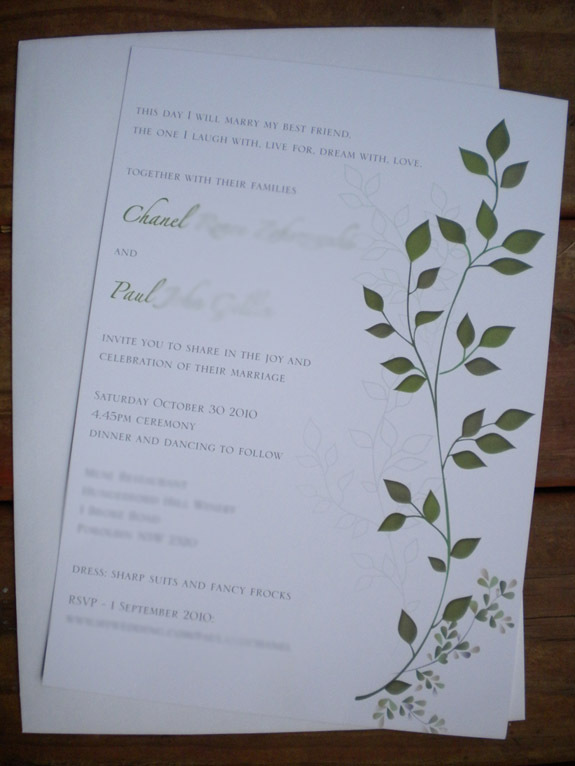 We went with a simple vine design, and decided not to have the extra bits like RSVP cards (guests will RSVP via our website, I hope). I bought a simple return address ink stamp from Vistaprint (free, postage was around $10). I dithered over the envelope choice for a while, ‘should I spend $80+ on fancy, shimmery envelopes, or $8 on plain white envelopes that might look cheap but are just going to be thrown in the bin after they’re opened??’. We went with the plain envelopes. My MOH and I addressed the envelopes yesterday, over bubbly & cheese – it only took an hour for us to hand-write the 60 addresses (110 guests in total). So much quicker and easier than spending hours putting together layered DIY invitations (not that these don’t look beautiful, they’re just not our style). I’ll be sending the invitations this week. I wonder if our friends will officially RSVP, or if they’ll assume we know they’re coming. I wonder if we’ll have to field awkward questions like “Can I please bring my new girlfriend?”. And I wonder if our ‘no kids under 12’ rule is going to cause issues. I think your invites look fab. Simple is always good!